Arsenal manager Arsene Wenger is "not helping" the club by delaying an announcement on his future, and his players have lost their hunger, says Arsenal Ladies legend Kelly Smith. Smith, who coaches the ladies' development squad, says "tension is running high" at the club's training ground because of the uncertainty. Wenger's side have lost four of their past five Premier League games. "My mind on Wenger has been turned a bit," Smith told BBC Radio 5 live. "I was always on the side of supporting him, but seeing the performances the last two or three weeks, with the lack of effort, the disorganisation, it seems to be the players have really lost the passion to play and get up for games. "It doesn't seem as if they've got that hunger there any more." Arsenal, who are sixth in the Premier League, host third-placed Manchester City on Sunday. Wenger is into his 21st year as Arsenal manager but is out of contract at the end of the season. The 67-year-old Frenchman said two weeks ago that a decision on his future would be revealed "soon", but no announcement has been made. Speaking on BBC Radio 5 live's Friday Sports Panel, Smith added: "I think by him keeping quiet, it's obviously not helping the whole situation. "It's quite hard being around the training ground because the tension is running very, very high just with the pure fact no-one knows whether Wenger is going or staying." Speaking at his weekly news conference, Wenger confirmed that he is preparing for next season. "If I stay two months or 10 years, I plan. I do my job exactly the same," he said. 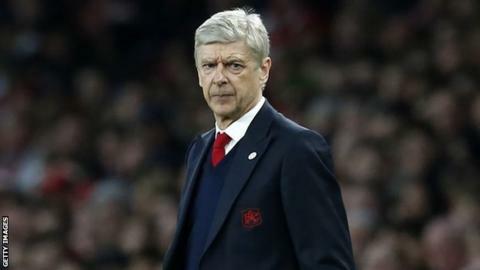 Arsenal chairman Sir Chips Keswick said recently the club's season had been "rather disappointing" but did not offer any clarification about Wenger's future. Earlier this month, the Gunners were knocked out of the Champions League at the last-16 stage for the seventh consecutive season. They are also in danger of failing to finish in the top four for the first time under Wenger, as they sit six points adrift of fourth-place Liverpool, though have two games in hand. "I think he needs to make a decision just for the pure love of the club," Smith added. "No manager is bigger than the club and I think Arsene Wenger is running the club at the minute. There's nobody above him making the decisions."